Ok, so my last post was about storytelling and so is this one...just a different medium. 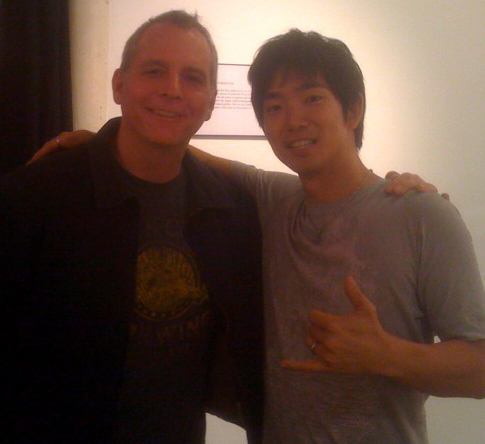 I had the good fortune to see the incredible Jake Shimabukuro this evening at "The Narrows" in Fall River, Massachusetts this evening. If you do not know his work, click on the link attached to his name above and be prepared to open Itunes and be amazed. Jake played for about two and a half hours and told as as many and complex stories as any feature film while only speaking briefly in between songs. He does not sing but allows his original compositions and his arrangements other artists songs to build his narrative structures with clarity and artistry that the audience of one hundred or so were absolutely silenced hanging on every note. Before he played a new piece called "five dollars unleaded" he described, in brief, the sensation of driving along and loving it on a semi full tank of gas. And then the process of looking for a gas station, fueling up, and jetting off again. A cute little story but his music told the FULL story. Windows, open, sunlight, etc. Illustrated with music. His arrangement of George Harrison's "While my Guitar Gently Weeps" is well known and tells the story as well the beloved original. Artful illustration and storytelling through choices made by an artist living in the joy of his work. Still unconvinced? Sample his version of Leonard Cohen's "Hallelujah". Its all there. He gets it. Now if film and book makers could take note and allow us to tell stories without so much exposition and talking, believe in the intelligence of their audience, we might connect with each other. In the meantime, we should all continue to tell our stories in one way or another. Tonight its storytelling through two feet of wood and some nylon strings. As Jake has said "If everyone in the world played ukulele the world would be a better place"
Jake is amazing! We love his work too! Best Ukulele performer out there. Like minds! Hope you are well!